Game 1 vs. Matt C.
I got my nearly-unavoidable Taudar game out of the way first. A lot of armies were along similar lines to this list. It was fairly disappointing to see so many of the same list across the tables. Claw harder at its ankles! The Wraightknight charged into my squad of Grey Hunters, and was slowly killing them off. But, then my Lone Wolf came in from the side and rended him to death. I still can't believe it. Granted, it's the only victory I had in the game, so I was going to savor it a little bit anyway. Game 2 vs. Jason B. This was the least fun of all my games. It was going along OK and I was killing a bunch of plague zombies, until turn 3 when 3 Heldrakes and 2 Vendetta dropped on the table. I might as well have just picked up my army then, instead of drawing out the inevitable. It was just a terrible, terrible end to a game. They flew on, used their breath template, and it was all but over. I'm still a little bitter about it. There's basically nothing any version of a Space Wolf army can do about that. Game 3 vs. Gary P.
This game was really fun, a welcomed change from the previous one. He had three Tervigons but they didn't pop out too many babies. He did have a hell of a lot of Gargoyles (50), though, and my Grey Hunters just leapt into the fray against them. My Lone Wolf, doing his thing. This was the Relic mission, and my Rune Priest and a Grey Hunter managed to throw themselves onto it at the last minute (after chewing through a unit of Gargoyles) and that's how I got the win. Otherwise, we'd have tied. Thankfully, his Hive Tyrant didn't get to do too much nastiness to me, but the Doom more than made up for it. Those things are tough. I really like the color scheme he chose for his Nids, the blue really stood out nicely. Game 4 vs. Bill M.
Day 2 started with this game. At first, I thought it was another Taudar list, but I was happy to see it was straight Eldar. I didn't have as much luck against the Wraightknight this time, but I did manage to keep the Wave Serpents busy. I wrecked two outright and immobilized a third. 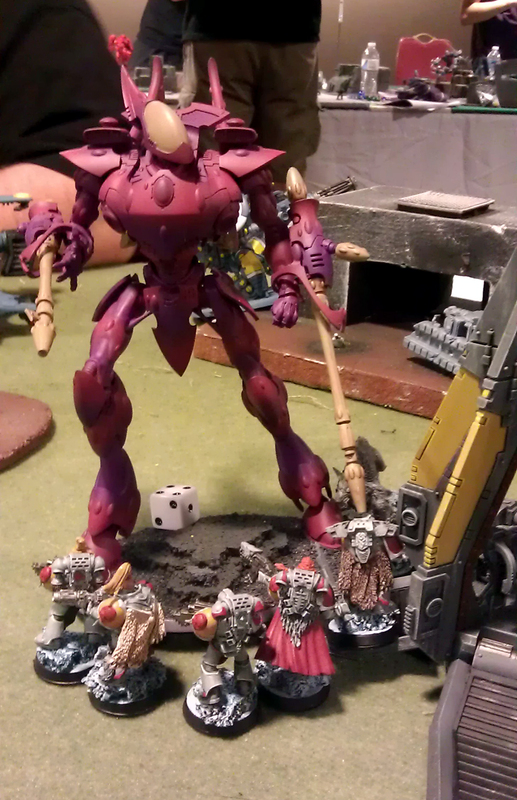 But I found out the hard way that Wraithguard are nothing to mess with. This mission was objective based, and with all his dudes zooming around, I managed to only hold onto one in my deployment zone. This Wraightknight handedly took out some Grey Hunters and that hurt my ability to capture/contest the others. Game 5 vs. Andrew L.
This was a totally unexpected matchup. I really didn't think I was going to play a game against Grey Knights, since they seem to have fallen out of favor with all the new hotness running around. That said, it was an interesting game. My Lone Wolf was MVP again, he took out a Dreadknight. Giving that guy Mark of the Wulfen, which gives him rending, was worth every point. In this game, he really regained his honor, he took out the Dreadknight, but died doing it. His buddies in Valhalla must have been so proud. I forgot to take a picture during this game or the next. Oops. I definitely could have taken more pictures over the weekend. Game 6 vs. Randy V.
Two games against Grey Knights was definitely not what I expected, let alone in a row. Now, unfortunately, we started this game almost an hour late. My original opponent dropped out and we had to spend some time sorting that out. I ended up getting paired up again, but it also meant we ended the game pretty early. 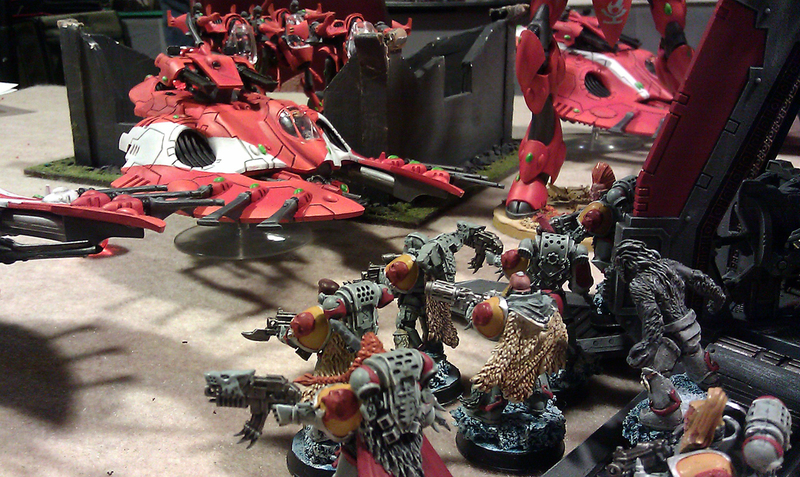 This was they Grey Knight list I knew how to handle- very low model count (19). I concentrated my Long Fangs on the Dreadknight and sent my melta guns to work on his Land Raider. 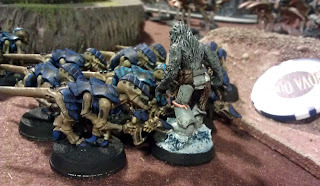 I took out his Terminator squad, but his Paladins readily chewed through a unit of Grey Hunters. The terrain on this table was probably the worst I'd played on. The center terrain piece was so large, you could have hidden a Wraithknight riding a Landraider behind it. Overall, I don't like how NOVA does their terrain set up, but only in this game was it a major factor for me. Due to the loss in time, I ended up winning, but had we been able to go the full time, I think we would have drawn. His Paladins and Landraider were all that remained, but they were coming for me. As is always my goal at these things, I got in some great games against some new faces. I could have done without the Heldrakes, but what are you gonna do? This is a very competitive tournament, people are going to bring those lists. You probably wouldn't believe the flier spam that showed up without seeing it for yourself. I'd love to see an option where you can select "I'm playing to compete" or "I'm playing to have fun" to help decide first round pairings. I'm not, nor will I ever be, a competitive player. I feel that with the way NOVA's victory path works (and with the intense level of competition), maybe the people with the fun mindset could be paired with each other first round. Of course, that system entirely lends itself to abuse, but I'm just sort of musing here. The point is, I suppose, that I would play a hundred games against my 3rd round opponent and his ilk. 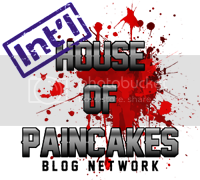 We just had such an enjoyable, totally fun game. That's not to say my other games weren't good, because they were, but that game is really the ideal I'm hoping to have each round when I go to a tournament. Despite a few snafus and my inability to use Torrent of Fire, I'm really looking forward to next year, which will be August 28 – 31, 2014. Same place, same weekend. It's nice that if no other tournaments work out for me, I have NOVA right in my backyard. Thanks for the write up. Seems like you have a pretty good mid 5th edition list there. So many things are wrong with 40K in the competitive environment. GW was never very good at balance and the 6th edition with allies and flyers essentially took their problem with to an exponential level. Ofcourse 5th at the end was pretty bad where some codexes had no shot and others had one or two builds that could maybe win a few games. Space Marine represent like 20% of GW overall sales but you would see like 5% of the players at major events using them. I wonder if these events might be more fun if they seperated prizes from winning. Sure the winner should get a trophy but I think any prizes should essentially be given out to all the players who made it through all the games at random. 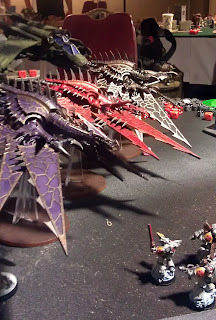 It's usually difficult to take a previous edition codex to a current edition tournament, but with what fliers have become, it'll probably be that way for a long time now. But, rumor has it that Space Wolves will be getting a new codex early next year, so I'm optimistic! Three heldrakes and 2 vendettas? That's insane. Yeah... yeah. This tournament brought out the worst kind of lists. How did the Dreadnought do? They seem to be out of place in 6th ed and with the rule change to the Lucius Drop Pod (Again!) there is no decent transport for them. Lone Wolf is an interesting choice, you don't see them being used much these days with 6th ed being all about shooting slow moving threats are just blown away or avoided. Wolf Lord, why? Why not a second Rune Priest with Master of the Runes? If your going to spend points on HQ's two or three RP's seem to be the way to go. Only two packs of Long Fangs, if your not spamming them they don't seem to be worth it. Three packs all armed with ML's are the way to go and if you take WG and split off 3 WG as leaders in TDA you can add a CML and put down 21 ML shots per turn. I don't see any reason to put the Dreadnought in a vehicle when he has twin linked autocannons and can park it right behind my Aegis. He did very well like that at the tournament. The Lone Wolf was my MVP, I will likely take him in every list. He killed at least twice his cost in every game. That's consistency I can get behind.